This gender reveal balloon kit is unlike any other! Surprise your friends, parents, significant other and the world when you make the big reveal of your baby boy or girl. 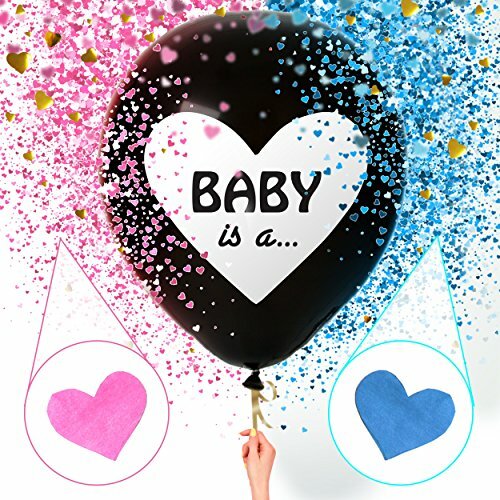 Have so much fun at your baby shower with Sweet Baby Co.'s gender reveal balloon with gorgeous multicolored pink or multicolored blue heart shape confetti with shiny gold foil hearts. Our oversized, GIGANTIC 36" black no-show balloons are opaque and conceal the confetti color (included) until you pop it. Upon pop, heart shape confetti of the color of your choice flies out like a cannon, showering the air with beautiful blue or pink colored hearts. It guarantees a unique photograph or video to capture this special memory with your little one. No mess, no fuss! Forget messy and potentially unsafe powder. With this kit you will receive one packet of multi-blue heart shape confetti with gold accent hearts, one packet of multi-pink heart shape confetti with gold accent hearts, one matching balloon string ribbon, along with two black balloons designed with "Baby is a..." heart print. Why two? Our kit equips you with a back-up balloon to ensure your announcement goes as smoothly as possible! With the balloon ribbon included, you can use this kit immediately - just inflate with an air pump. We keep your event needs in mind. HOW TO USE: Our balloons are designed with a extra large balloon neck made for easy filling of confetti. When ready to expand, first fill the balloon with the appropriate confetti color (roll up a piece of paper for an easy funnel!). Then, fill with helium. Alternatively, balloon may also be filled with air (will not float when filled with air). No tools are required. If you have any questions about this product by Sweet Baby Company, contact us by completing and submitting the form below. If you are looking for a specif part number, please include it with your message.